at-Taiyebaat committee organized a Valedictory Function for the first batch of ladies students enrolled under the SCOPE – Communicative English Language Training Programme on 26th Jumaadi ul-Ukhraa 1437, 3-4-2016, Sunday at Markaz-e-Husaini Hall, Badri Mohalla, Wadi, Vadodara. 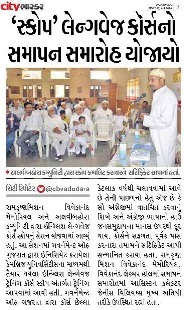 Mukaasir ud-Da’wat Saiyedi Mohammad Nuruddin Bhaisaheb (dm) presided the function. Ra’s ul-Hudood Hakeemuddin saheb and SCOPE District Head Mr. Rajesh Nambiar shared the dias. The students along with their family members were present. Mukaasir ud-Da’wat (dm) said in his speech that, “Today I feel that I am in UK as all of you speak English so nicely and confidently. I must say that the effort started by at-Taiyebaat today should continue and like this batch many of you should encourage others to take part in this type of educational activities and help in building positivity in our community. English is an International Language and everywhere you will have to face it. Make it the part of your routine as it has become the basic tool of communication. 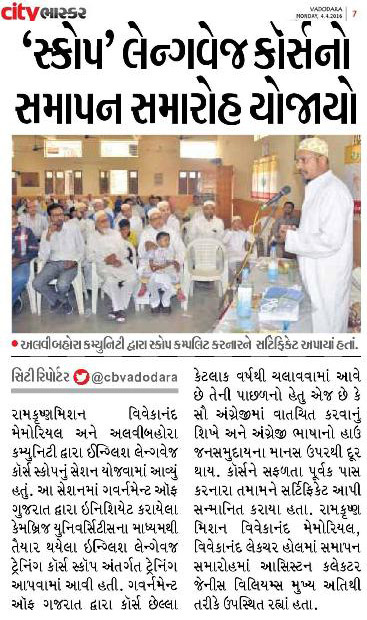 When I was in school studying in 6th Class Marhoom Mukaasir ud-Da’wat Saiyedi Dr. Husain Mo’eenuddin saheb (ra) inculcated in me the habit of reading Times of India newspaper and this has helped me immensely in making the base of English Language strong. I also urge all of you to first know your Mother Tongue i.e. Arabicized Gujarati known as Lisaan ud-Da’wat which we speak at our home. You should inarguably know how to read, write and understand our language as it becomes your social recognition and cultural identity. Rasoolullaah (saws) said that, “The Man is hidden under his Tongue”. If you want to know someone make him speak and let him express his views”. The students enacted a short play on different topics which highlighted some of the social issues such as, “Save a Girl Child”, “Obeying Traffic Rules” and “Internet-A boon or a Curse”. They delivered dialogues and discussed the issues elegantly and efficiently. They all felt that now they with them the power to converse in English in any circumstances. 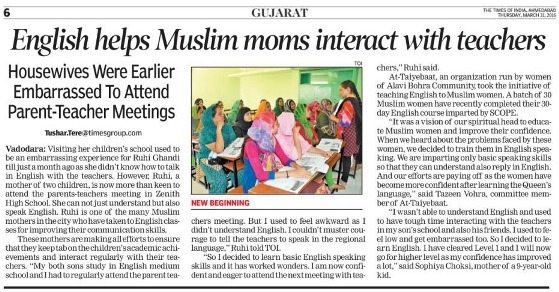 By the Tawfeeq and Grace of Allaah Ta’aala and Du’aa-e-Ma’soor of Huzoor-e-‘Aali TUS at-Taiyebaat along with the assistance of Panjatani Charitable Trust have successfully started the English speaking and Communication Skill classes with 23 students. On 22-5-1437/29th Feb 2016 had an inauguration ceremony presided by Ra’s ul Hudood Dr. Zulqarnain Hakeemuddin saheb and SCOPE District Head, Mr. Rajesh Nambiar. 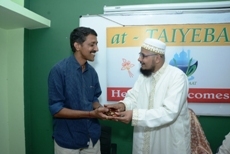 The representative of Panjatani Trust who has sponsored fees and Aejaazbhai Vohra-'Ali Asgharbhai Chaviwala who has given their premise as training venue were also invited. Mr. Rajesh Nambiar made the candidates aware about the success story of this program even for the tribal people. He said that, "All the candidates should work hard to get best results and each one of them should feel the change after this course as you have invested a lot of time for this so the gain must be clear in your speech." He was very much moved to see the class of all ladies students as it is really difficult for them to take time out from their household chores, family and social responsibilities. All and above to come forward and to show interest in learning English is truly a big step towards women enlightenment and empowerment. 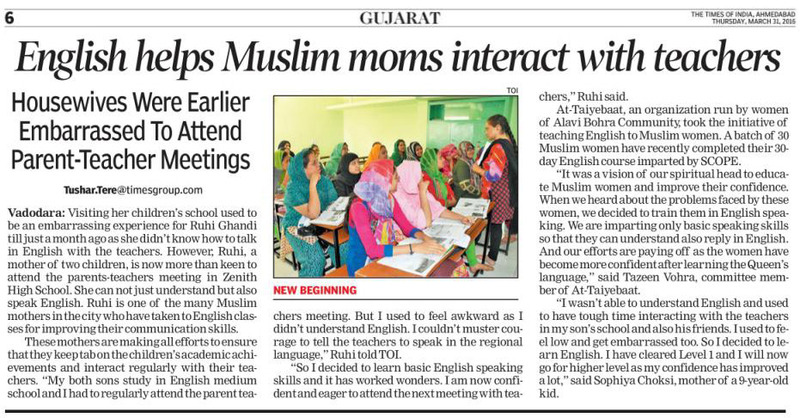 Ra’s ul Hudood saheb encouraged the muminaat to learn communicative English speaking for a better personality and expression. Today English is the most used language globally for communication and it is also now necessary to give better education to the child. Mother is the first teacher of her child. When she is aware of the Language in which her child study in the school then it would prove useful to a great extent in helping her child in completing the school work, speaking with the teachers and other parents, reading circulars and filling forms etc. She would be confident enough to speak out her views and make her presence felt in any gathering.